I left my home the other day to head south to Nashville and Murfreesboro, Tennessee area for a tradeshow for work. As I was leaving my brown lawned home (ok with the exception of my weeds), I invisioned that I would be encountering a virtual dust bowl as I headed south. For some reason I just figured that south of us would have simply not received as much rain. I visit the Nashville and Murfreesboro area about once a year. I love it here. I love how friendly everyone is, how it is common practice for children to refer to adults as sir and ma'am. How gentleman hold the door for women and there is a general respect for one another. I love the history, this area is a civil war buff's dream come true. I love the historic homes, the rolling hills and the meat and threes. I love the honky tonks, the country music, that wearing blue jeans, cowboy boots and a tee shirt is acceptable clothing where ever you go, even if it is out at night. Most of all, I love how people blend the question "How are you" into one word, "Ha-u." I always come back home saying that. Murfreesboro reminds me of Scottsdale, Arizona in a way. The area that I generally stay in either city is generally in the newer developments with well manicured lawns, large shoping areas and great restuarants. Scottsdale happens to be another favorite city of mine so when you mix in the southern charm into an already neat area, this town is always a joy to visit and will remain at the top of my list of favorites. Upon my arrival, I was stunned to see how green everything was. Even several hours away, I started to take notice of how green the hwy ditches were, that the fields were green and the trees looked healthy and full. 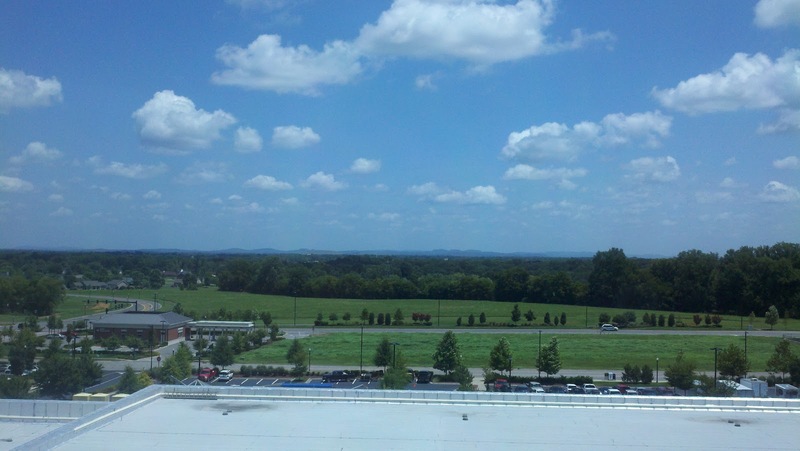 The green continued as I arrived in Murfreesboro. Below is a picture from my hotel room. I can't even count how many times I commented on how green things were around here. I wish I could take it back home with me! I didn't realize how much I missed seeing green lawns, fields and ditches. Oh well, I suppose that just as I leave the area that I love, I will have to leave the green grass behind as well. I am in the South (the Carolinas) and we have had a good year in terms of rain. It has rained every few days. Wish we could send a little your way! We(middle TN) were without rain for sometime. Our gardens and yards suffered from lack of rain. 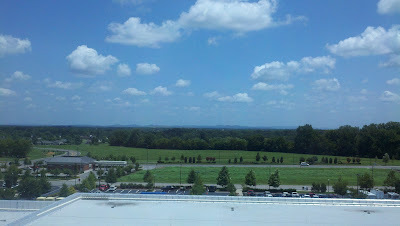 When I was in college (MTSU-the ' boro), the dorm mother referred to Warren County as God's country. Perhaps she was right...it is beautiful here!